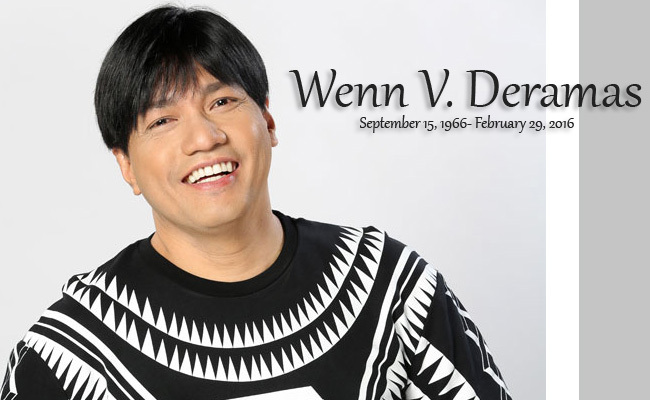 On February 29, 2016 (Monday), the entire Filipino showbusiness was mourning as the veteran director Wenn Deramas passed away due to cardiac arrest. The Kapamilya director died at 6:20A.M. in the Capitol Hospital. His remains were brought to Arlington Memorial Chapels in Araneta Avenue, Quezon City and will stay there until Friday this week. It was a tragedy for the Deramas family because Wenn died only a few hours after his older sister Wawa Deramas passed because of the same illness. Atak, Wenn Deramas' close friend and a comedian, was with the director when he died. The comedian shared their whereabouts on Sunday and said that the director was jolly the entire day until he received a call from his driver's wife that they rushed his sister to Capitol Hospital and was revived four times. Deramas and his friends rushed to the hospital right away to check the real status of Wawa. At 2 AM, Wawa Deramas passed. Atak said that Deramas was very emotional because of Wawa's death. He said that the director wailed to the point that he could no longer breathe that lead to his sudden attack. Atak also mentioned that the doctors tried to revive Wenn for 3 hours and twenty minutes until they decided to give up. Direk Wenn's death has been a surprise to his family and his friends because he just underwent an angioplasty recently. Direk Wenn's mother studio Star Cinema released an official statement about their loss, "We are deeply saddened by the sudden passing of our Kapamilya Direk Wenn Deramas. Today we lost not just one of the greatest minds but a loving son, brother, friend. This is a sad day for the industry. He will forever be remembered." Direk Edwin V. Deramas passed at the age of 49. He was the director of the hit teleserye 'Mula sa Puso', 'Marina' and 'Flor de Liza'. 'The Amazing Private Benjamin', 'Dahil Mahal na Mahal kita', 'Ang Tanging Ina' and a lot more blockbuster comedy movies were also made under his brilliant direction. Condolences to the local showbusiness and the Deramas Family from CEnterTech team.